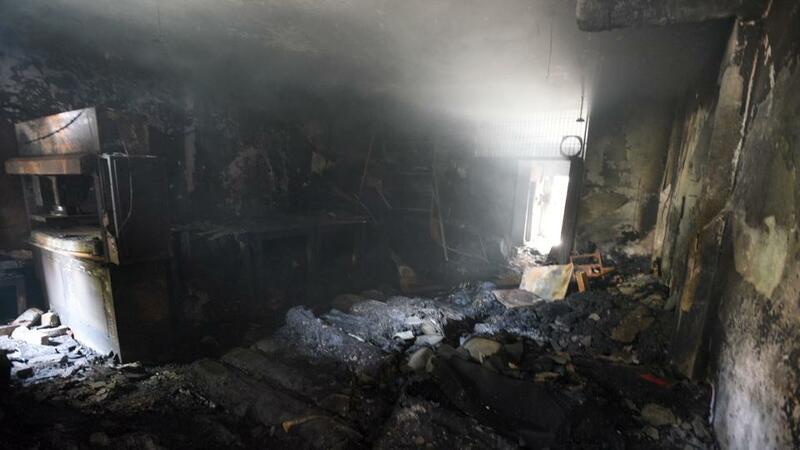 Days after a devastating fire broke out in an illegal shoe factory – which killed 4 workers among two minors- in Raj Park Sultanpuri, nothing has changed on the ground as unauthorized factories in the residential area continue to operate. One can find dilapidated buildings from where these illegal small-scale factories operate, raising questions about the safety of workers. Of late, these factories have turned into death traps for migrant labourers who perhaps don’t even know the name of their owners. Raj Park is officially a residential area located in Sultanpuri on the outskirts of Delhi. However, residences have been illegally turned into small-scale factories by many locals. The buildings from outside appear as residential houses without any sort of nameplates or boards, but small-scale machines and equipment are set up inside, producing goods like shoes, jeans, sandals, and firecrackers. Hari Shankar an owner of a local factory says “Most of the owners, lock their factories from outside, especially at night, in a bid to avoid the notice of officials. Whenever any untoward accident happens, workers get trapped inside. This leads to causalities and the same thing happened the last time as well”. It is not fist instance of fire at an illegal factory where workers died whilst trapped inside.17 people died in the fire at the Bawana firecracker packaging unit. Similarly, in 2011 a massive blaze in a shoe factory at Peeragarhi in West Delhi had killed 10 workers as they were unable to escape due to the blockage of all exit points. Factories with a common entry-exit point and negligible ventilation operate in the locality aggravating chances of similar untoward accidents in the future. Veena Jain a resident, of Raj park, laments,” A huge disaster looms over our heads but what we can do if the whole locality has resorted to this. If there would have been a few factories, maybe we would have resisted but now almost every house has a one. This isn’t possible without police, administration, and owners being hand in glove with each other”. The condition of workers in these factories is also appalling and devoid of even basic safety working conditions. Vimal, a worker in a local shoe factory says “Our factory is in the ground floor and we sleep in the upper floor where we also stock our raw material and finished products”. Besides, hundreds of minors work in these factories. “They prefer children as they have to be paid minimal wages” adds Vimal. “These illegal factories have extremely small set up and workers are not provided with sufficient amount of money. How we can expect that these factories would have any arrangement for the safety of poor labors,” said Nagendra Pal, who is President of Bhartiya Mazdoor Sangh. Meanwhile, High Court has directed Delhi government, police and MCD to carry out a proper inspection of areas having unauthorized factories stating that it is concerned about the right of laborers and right to live. But when asked about the number of illegal factories operating in Sultanpuri at present, an employee at North-west MCD Hari Om Prakash said “As we have not got any complaint from residents of that area they don’t have any idea”.